Lapidary analysis of Pakal's mask reveals a funeral piece composed of more than 300 tiles of albite, albite-kosmochlor, jadeite-albite, and veined quartz. These characteristics were assayed with non-destructive techniques such as X-ray diffraction (XRD), petrography, scanning electron microscope analysis (SEM-EDS) and infrared spectroscopy (IR). Outstanding in the cultural area known as Mesoamerica is the use of mask in funerals. The masks which were important objects as a part of the funeral furniture of kings and high ranking people. Because of this tradition, the most beautiful mosaic masks were made with tessellae of different kinds of blue-green minerals and rocks, such as jadestone, turquoise, amazonite, malachite, travertine, diorite, serpentinite, etc. long. The Pacal Mask is a surpassing piece of the great mortuary furniture. Pacal was the most famous king from Palenque, which is an important ancient Mayan city located in Chiapas state in southeast Mexico. This mask was elaborated with more than 300 tiles mounted on a wood and paster base, and has diverse green shades moving to white, and is between 2 millimeters to 7 centimeters long. It has been established that the raw material of several Mayan masks possibly comes from the Motagua River Valley in Guatemala where jadeite, albite and associated rock deposits are found (Foshag 1955, 1957; Harlow 1993, 1994). In the case of the amazonite, its provenance is not yet well-established, but it is now known that a deposit is located in Chihuahua State, in northern Mexico (Sanchez-Hernandez et al., 2002). Turquoise deposits are widely distributed, mainly in the southwest and south of the USA, and there are also some minor deposits in northern Mexico. 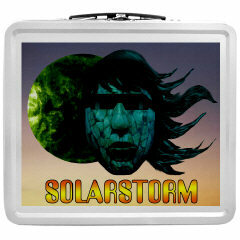 Show Pakal Mask in your lunch box. A great gift for kids. Click to buy it.